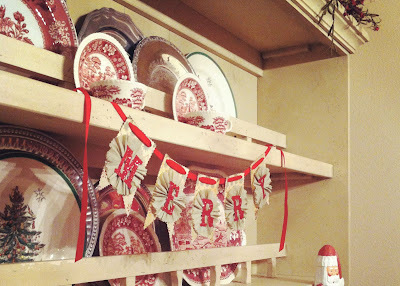 Being Mrs. Gentry: Christmas Entertaining: Hosting a Cookie Exchange! Christmas Entertaining: Hosting a Cookie Exchange! One of the "sweeter" parties that I've thrown involves dozens and dozens of cookies! Last year I hosted my first cookie exchange for the Senior girls in my Bible fellowship class, and I've decided to do it again this year because it was so much fun. Who doesn't love cookies? Mine probably won't look like those, but aren't they beautiful? I've asked each girl to bring 4 dozen cookies of any kind. Decorated, bar, regular, whatever! I've seen several party "logistics" ideas online calling for 6 dozen and specifically only decorated Christmas cookies, but that seems like a lot of cookies and way too rigid rules for this lady. I am an equal-opportunity cookie exchanger. No cookie left behind! This merry banner was first thing I bought on Etsy a long time ago. So fun! For decor, hopefully I'll have all of my Christmas decorations up by then. (Then, in this case, would be only 4 days before Christmas Day.) 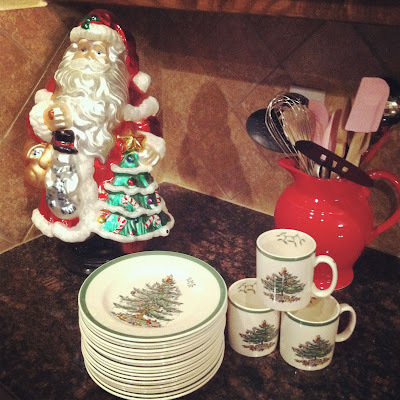 I'll be using my Spode Christmas china. I have service for 24, which will be more than enough for a party of this size. I'm on the hunt for red and white polka dot napkins, so if you have any sources for those, I would absolutely love to hear them. Santa watches me cook. He's one of my favorite decorations. I'm serving mostly savory snacks, like finger sandwiches, sausage balls, and some chips and dips. I may add a few bite-sized sweets, but I imagine there will be enough cookie sampling to satisfy each sweet tooth. For drinks, I'm planning on hot chocolate, coffee, soft drinks, and water. I've ordered these windowed bakery boxes from BakeABox.com and will have ribbon for the girls to tie up their packages before they take them home. I might even spring for some of that ubiquitous red and white baker's twine. I'm not stressing over it though. I think it's important to keep in mind that celebrating Christmas with our friends doesn't have to be a Pinterest-worthy event. More than anything, it should be a fun night celebrating the birth of our Savior with some laughter and cookies thrown in for good measure. I'm linking up today with another new mom, Nina, at According to Nina! 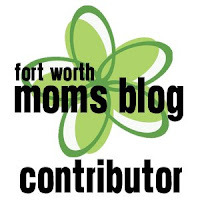 She and four others are hosting a blog link up for fun holiday ideas. Hop on over to see more! So amazing! I love cookies exchanges and their a great way to gain new recipes!